Jonathan Fielding plays Rev. José, one of four reverends in the cast of “Church’’ at Harbor Stage Company in Wellfleet. WELLFLEET — “The mystery of faith’’: Any regular churchgoer has heard those words, or a variation on that liturgical theme, countless times. That mystery lies at the heart of Young Jean Lee’s “Church,’’ now at Harbor Stage Company under the direction of Brenda Withers. It’s the second production for the fledgling, actor-led company, following a riveting “Hedda Gabler’’ that featured Withers in the title role. 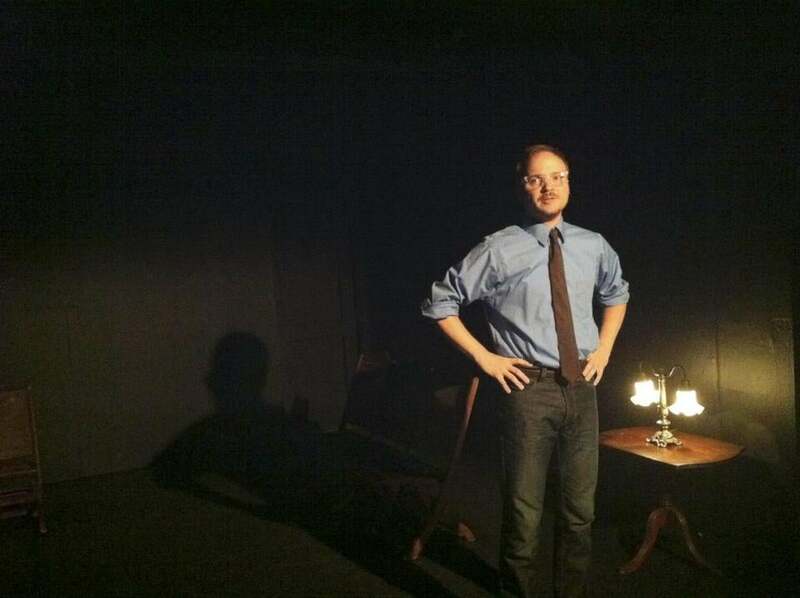 “Church’’ is less accessible than “Hedda,’’ posing stiffer challenges for an audience, and that is obviously what the envelope-pushing Harbor Stage gang has in mind, intent as they are on offering an aesthetic alternative to the nearby Wellfleet Harbor Actors Theater. “Church’’ is alternately engrossing and irksome, insightful and willfully opaque. Some parts are as rich and strange and moving as faith itself, touching on questions not just of who we are but why we are; others reek of self-indulgence on the part of a playwright who allows a gift for poetic expression to take her, and us, up some blind alleys. Yet if there are moments of overreach, “Church’’ is largely irony-free and devoid of mockery. Raised in an evangelical Christian family, Lee resisted the tenets of organized religion, but “Church’’ comes across as a sincere inquiry into the spiritual life. Lee has structured the one-hour piece as a revival meeting at which four reverends — well played by Withers, Amanda Collins, Amie Lytle, and especially Jonathan Fielding — take turns delivering sermons, making confessions, and telling roundabout stories that may or may not double as parables. The reverend then dishes out some tough talk to those of us in the audience, making clear that neither the young man nor we possess any of the above attributes. In a fire-and-brimstone diatribe that carries stylistic echoes of “Sinners in the Hands of an Angry God,’’ a sermon by the 18th-century preacher Jonathan Edwards, he laces into us for our self-delusion and superficiality. “Your spiritual bankruptcy is reflected in your endlessly repeating conversations about your struggles to quit smoking, quit drinking, quit junk food, quit caffeine, quit unsatisfying jobs and relationships — and this is what you talk about when you are trying to be deep!’’ he says. By the time Rev. José is done, we’re in need of gentler treatment, which we get from the sweetly solicitous Rev. Amanda (Collins). She asks if there are any prayer requests. The opening-night audience seemed taken aback at being asked to participate, and did not fully enter into the spirit of this sequence — one of those moments when “Church’’ resembles church all too fully. As the reverends take turns standing at the plain wooden pulpit to offer testimony or instructive tales, we hear redemption narratives that begin with an admission of past misdeeds and end with the protagonist stumbling toward grace. There are tales of cruelty and compassion, and explorations of the nature of sin and the possibility of salvation, all of it wrapped in Lee’s gift for startling language and arresting imagery. Easy or comforting answers are scarce. “I don’t know that God exists any more than I know that God doesn’t exist,’’ Rev. José says. “Church’’ builds to an incantatory power at times, and Lee makes shrewd use of religious rituals, as with a call-and-response number during which a choir enters from the back of the theater and moves across the stage, singing a spiritual. It is an expression of communal joy. For all the rhetorical fireworks, the production’s most memorable moment arrives during a spellbinding dance sequence choreographed by Adrienne Campbell-Holt. More than any words could do, the movements of the human body somehow represent the purest articulation of faith and its mysteries.